Step 1 Heat a large heavy-bottomed pot over high heat for 2 minutes. Add the olive oil, rosemary and chile. When the rosemary and chile start to sizzle, add the onion, fennel, carrot, celery, garlic, thyme, parsley, bay leaf, fennel seeds, peppercorns and salt. Step 2 Saute the vegetables for 8 to 10 minutes, stirring often, until they begin to caramelize. Add the tomatoes and cook for 5 minutes. Step 3Add the water, bring to a boil and simmer until the vegetables are soft, about 10 minutes. Cool slightly, then puree in a blender, in batches if necessary. Strain. Cool completely. 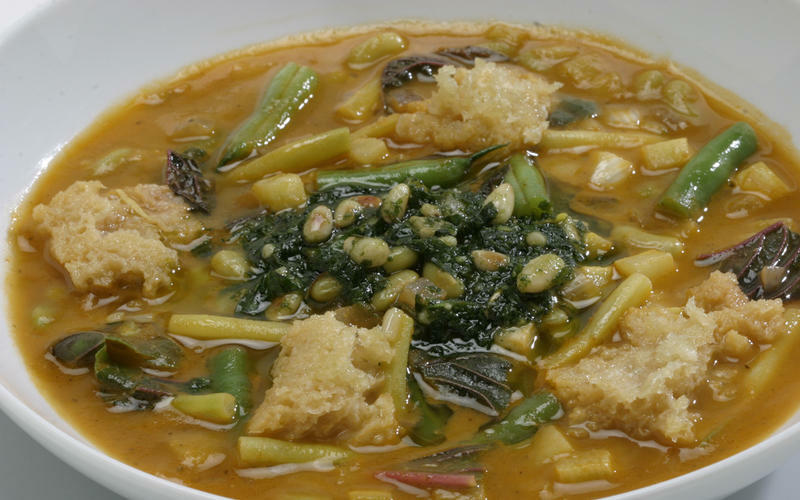 In Recipes-list.com we have selected the most viewed recipes from category - Main courses Soups Vegetarian . Enjoy the best recipes specially selected for you! Lucque's soup au pistou with Parmesan croutons is the right choice that will satisfy all your claims.